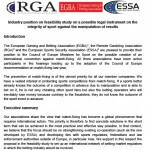 The European Gaming and Betting Association (EGBA)1 , the Remote Gambling Association (RGA)2 and the European Sports Security Association (ESSA)3 are pleased to provide their position to the Council of Europe Ministers for Sport on the possible creation of an international convention against match-fixing. 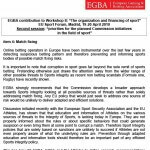 All three associations have been active participants in the hearings leading up to the adoption of the Council of Europe recommendation on match-fixing last year. 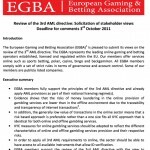 The European Gaming and Betting Association (EGBA) 1 is pleased to submit its views on the review of the 3 rd AML directive. 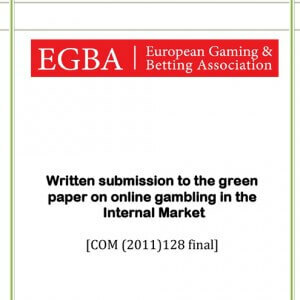 The EGBA represents the leading online gaming and betting operators established, licensed and regulated within the EU. 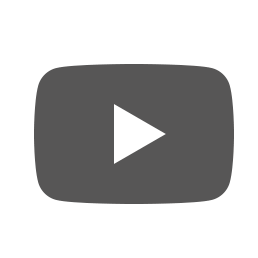 Our members offer services online such as sports betting, poker, casino, bingo and backgammon. 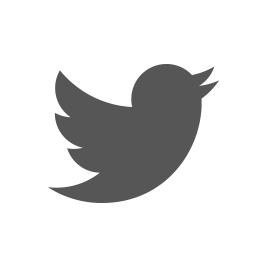 All EGBA members comply with a set of strict rules in terms of governance and account control. 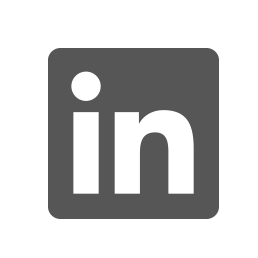 Some of our members are publicly listed companies. 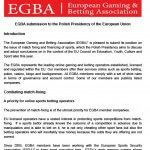 The European Gaming and Betting Association (EGBA)1 is pleased to submit its position on the issue of match fixing and financing of sports, which the Polish Presidency aims to discuss and adopt conclusions on in the context of the EU Council on Education, Youth, Culture and Sport later this year. 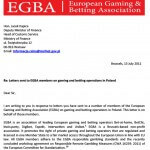 I am writing to you in response to letters you have sent to a number of members of the European Gaming and Betting Association (EGBA) on gaming and betting operations in Poland. This letter is on behalf of those members. The launch of the Green Paper represents a bold and at the same time inevitable step for online gambling in the EU. Whereas others have shirked their responsibilities, Commissioner Barnier has taken a first step towards a European approach in a sector characterised at present by unsustainable legal uncertainty and fragmentation. Initial reactions at the European Parliament confirm that there indeed is political momentum to move forward at EU level. The true test for the Commission will be to ensure that the consultation phase is followed by concrete proposals that will effectively address market fragmentation and legal uncertainty. Online betting operators in Europe have been instrumental over the last few years in detecting suspicious betting pattern and therefore preventing and informing sports bodies of possible match fixing risks. It is important to note that corruption in sport goes far beyond the sole remit of sports betting. Pretending otherwise just draws the attention away from the wider range of other possible threats to Sports integrity as recent non betting scandals (Formule one, Rugby) have recently shown.